The Welsh Government's cabinet has met in north Wales for only the second time since devolution in 1999. Ministers have also met Horizon - the company behind the stalled Wylfa Newydd nuclear power station on Anglesey. Earlier this week, Welsh Secretary Alun Cairns met representatives of Horizon's parent company Hitachi in Tokyo. First Minister Mark Drakeford said it was up to the UK government to bring the company back to the table. BBC Wales has learned Mr Drakeford was invited to go to Japan with Mr Cairns but turned it down because of diary commitments in the UK. Welsh ministers held their meeting a day after the National Grid confirmed it was cancelling plans to build pylons connecting Wylfa to the network. They gathered at the government's offices in Llandudno Junction, where the cabinet previously met in 2011. At the time, then First Minister Carwyn Jones said the meeting "will not be a one-off". Eight years later, his successor Mark Drakeford hopes Thursday's meeting will be seen as a sign of a commitment to the region. He has given Economy Minister Ken Skates special ministerial responsibility for north Wales. After his meetings in Tokyo, Mr Cairns said there was still a place for nuclear power in the UK, "but any future offer must represent good value for both the taxpayer and the consumer". UK government sources said there may be other ways to fund Wylfa, but there was concern about whether alternative proposals could be prepared quickly enough. It has also emerged that Mr Cairns's office asked whether Mr Drakeford or another Welsh Government minister wanted to come to Japan to meet companies that employ people in Wales, although Hitachi was not on the itinerary when the invitation was sent. The first minister's office replied that "the trip is not going to be practicable" while the assembly was sitting. Both governments agreed to discuss opportunities for joint activities in the future. 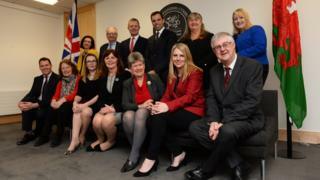 The north Wales cabinet meeting follows a period of "difficult news" for the region's economy, Mr Drakeford said. Airbus, which employs 6,000 people in Broughton, has warned it could move wing-building out of the UK if there was a no-deal Brexit. And last month it emerged that the German-owned Rehau plastics factory in Amlwch was at risk of closure, threatening 100 jobs. The first minister said he would be "listening carefully" to what people in north Wales had to say. "We will provide whatever assistance we can to support individuals and companies affected by the recent announcements," he said. "I have previously called on the UK government to put in place a funding model to deliver large infrastructure projects such as Wylfa Newydd and I repeat that today."